Background: Hepatocellular carcinoma (HCC) is the third leading cause of cancer-related death worldwide. HCC patients have a poor prognosis due to shortage of effective therapies though a small proportion of patients are eligible for curative treatments. Precision medicine, a recently emerging medicinal model, has provided more avenues in the management of HCC. Methods: Published literatures related to HCC and precision medicine were reviewed. The article aims to discuss the recent progress of HCC therapy under the guidance of precision medicine, and the major obstacles for its application. Results: Sorafenib remains the only first-line drug proved for treating advanced HCC, though it displays limited beneficial effects. Advances have been achieved in the technologies of new generation sequencing and molecular biology, bioinformatics, big data and cloud computing frame. Recent progresses in seeking tumor biomarkers and oncogenic addiction loops, re-analyses of failed clinical trials, techniques of circulating tumor cells and liquid biopsy, new clinical designs based on molecular information have offered a glimmer of hope in combating HCC. However, there are many obstacles, such as high heterogeneity, unpredictable driver genes, oncogenetic addiction loops and actionable events and drug resistance. 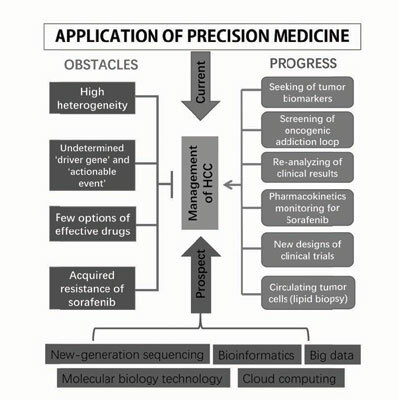 Conclusion: The future progress in interdisciplinary application of computing, mathematics and information in medicine may further promote the development of precision medicine in the prevention, diagnosis, treatment and monitoring of HCC. We hope this article can provide some new clues for clinicians and scientists engaged in the clinical and basic research of HCC. Hepatocellular carcinoma, precision medicine, personalized medicine, sorafenib, bioinformatics, tumor biomarkers.